A root irrigator injects water deep into the soil at intervals around a tree's dripline. There are several things you can do to ease your plants through a dry summer and even improve your landscape at the same time. 1. Assess your priorities. Survey your landscape: What areas or individual plants do you want most to save? Give top priority to irrigating established trees and shrubs; they’re virtually irreplaceable. Consider perennials a second priority. 2. Identify root zones. The roots of various plants grow to different depths; the trick is to apply just enough water to moisten the roots. Most tree roots are located in the top 2 feet of soil. The dripline of a tree or shrub, which runs around the perimeter of the canopy, outlines much of the root zone. Focus water there. 3. Try a root irrigator. The hose-end device has a needlelike shaft that injects water into the ground, irrigating roots directly so no water is lost to evaporation. Check garden centers for root irrigators like the one from Hound Dog Products (about $20; 800/694-6863). Insert the shaft 6 to 12 inches or deeper into the soil around trees and shrubs. After watering in one spot along the dripline, move the irrigator to another spot until you complete one round-trip. 4. Check soil moisture. Dig down 1 foot with a trowel or spade and feel a handful of soil. An even easier way to test moisture is to use a sampling tube to “read” the soil. When you push the metal tube into the ground and twist it back out, it extracts a 12-inch or longer core, showing in cross section how wet or dry the soil actually is. If the top 2 inches of the soil sample are dry, it’s time to water. Sampling tubes are available from [XREF “http://www.forestry-suppliers.com” “Forestry Suppliers”] (from $40; 800/647-5368). 5. Irrigate slowly. Slow soaking limits runoff and encourages plants to develop deep root systems that are better able to tolerate drought. The heavier your soil, the more important slow soaking is in preventing runoff. Using an oscillating sprinkler to water large areas helps reduce runoff. But if you see puddling, turn the water off for an hour, then start again. To minimize evaporation, irrigate in the early morning or evening. 6. Build watering basins. Mound soil berms around young trees and shrubs such as roses to concentrate water on the root zones. Fill the basin with a slow-running hose so water soaks in. 7. Use soaker hoses. These porous hoses ooze water along their length. Run them among flowers and shrubs or along hedges or rows of vegetables. 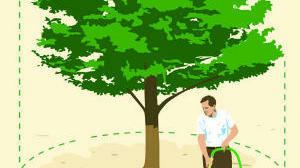 Coil them under the driplines of large trees; a good average length is 50 or 100 feet. 8. Apply mulch. Drought or not, spreading a layer of mulch over the soil around plants is simply good gardening. Mulch reduces evaporation, insulates roots from extreme temperature changes, and helps prevent weeds, which steal water needed by desirable plants. Spread a 3-inch layer of organic mulch such as compost or shredded bark around trees and shrubs; for flowers and vegetables, apply 1 to 2 inches. Gravel and other mineral mulches are also effective. 9. Modify lawn care. If local restrictions allow lawn irrigation, there are some things you can do to reduce the amount of water you apply. Set your mower to cut at the high end of the recommended range: 1 1/2 inches for bent grass; 2 inches for bluegrass and perennial ryegrass; 3 inches for tall fescue. Taller grass shades the soil, reducing evaporation. In early June, fertilize with 1 pound of nitrogen per 1,000 square feet of turf to strengthen grass before it becomes stressed. In July, cut back to a 1/2 inch of water every week; under this regime, lawns turn the color of straw and go semidormant through summer but bounce back after the weather cools. 10. Be water-wise with pots. Use glazed terra-cotta or plastic ones, which hold water better. For extra insulation, nest smaller pots inside larger ones, or bury pots up to their rims in the ground. 11. Harvest rain. Even in summer months, some rain usually falls on the Northwest, and roofs catch a lot of it. Channel runoff into a rain barrel, then use it to water container plants. Several kinds of rain barrels are available from (from $90 for a 40-gal. barrel; 800/955-3370).